Apart from normal potted plants, I have some vines and creepers, which, do add a splash of colour to the otherwise dull concrete structure of my house, and the surroundings. 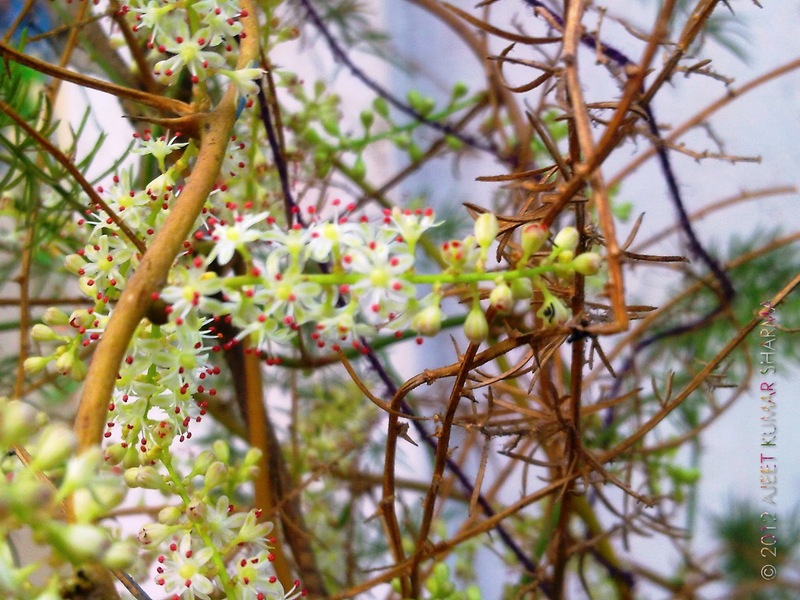 As of now, I'm not having too many vines, but, still, I expect the numbers to increase, as I'll be introducing some more plants gradually, to my collection. As of now, what I have is one grapevine, which, some of you might already be aware of, another one, is a Rangoon Creeper, (Quisqualis indica), aka madhumalati in hindi, and one is a wild asparagus (as for what I could find out about it). I've been longing to get a Cypress Vine, Ipomoea quamoclit, but, till now, haven't been lucky enough to find one in any of the plant nurseries, I usually visit. 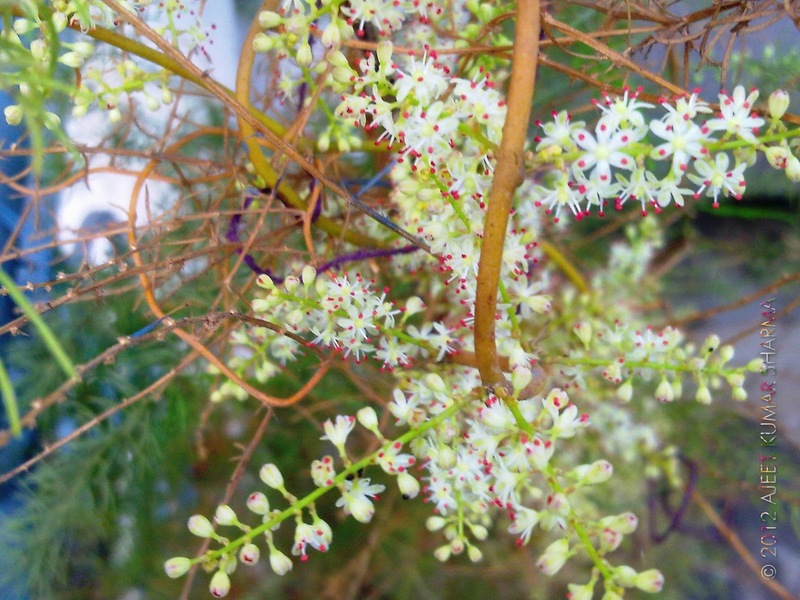 I must say, the wild asparagus, besides, looking good in that dark green colour, in the form of long vines, has some sweet smelling flowers, in the during mid fall. Before, I had it for myself, I didn't know that it does bloom. And, while the flowers are tiny in size, and, not even a very good watch, the sheer numbers, in which these bloom, makes the flowers stunning. 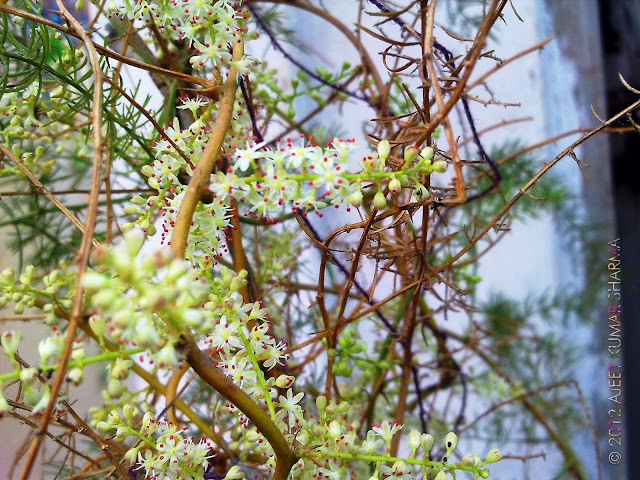 Here are some pics of my wild asparagus vine in blooms. 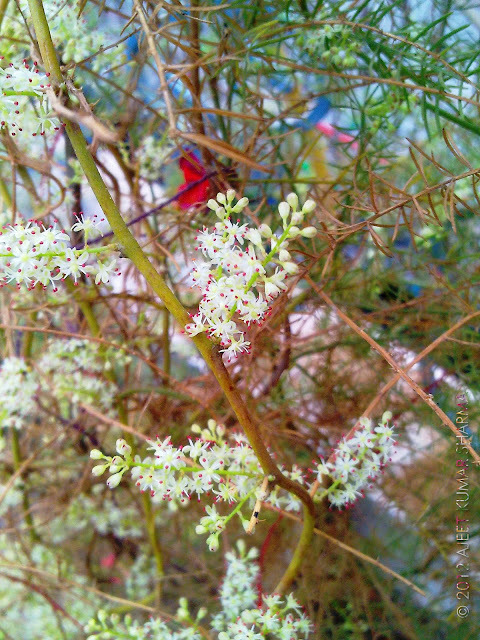 Note: Please note that some of these images/photos have been digitally enhanced to some extent, to increase the saturation of the colours, as my cellphone camera, isn't much capable of capturing enormous details of such tiny flowers. All these images are taken from one of my postings on a forum, and hence are a bit different in formatting from the ones, I usually post. The good thing about these creepers is that these are extremely hardy and grow well in almost any kind of soil and pots too, given that you are caring for them once in a while. 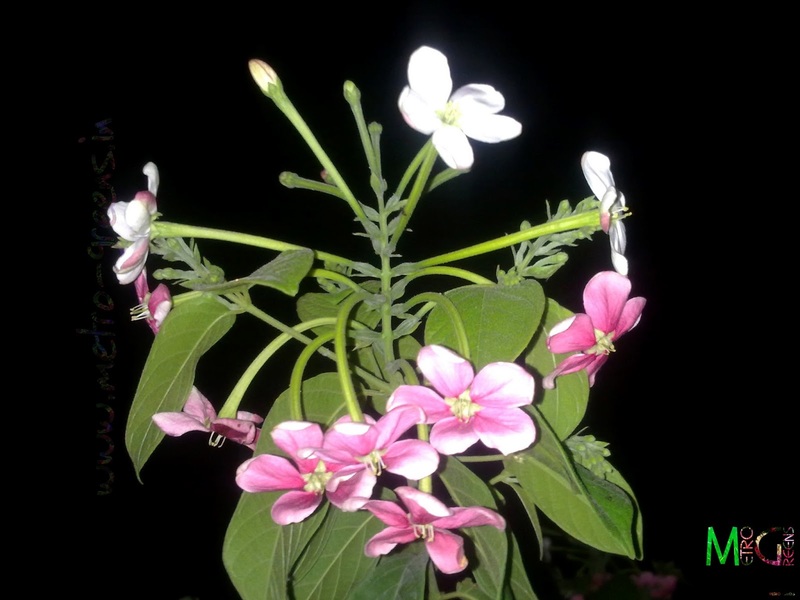 Since these are vines, these have long root systems, and need care in terms of regular watering, particularly for the rangoon creeper, and these will go a long way. Of late, my Rangoon creeper vine's started blooming too. Though, it's not even a year old, but, has grown enough to bloom, a bit. 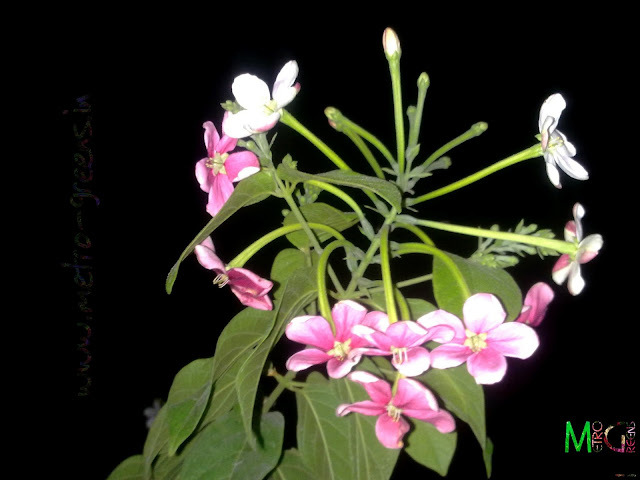 Here are a few shots, I took, of my Rangoon creeper blooms. 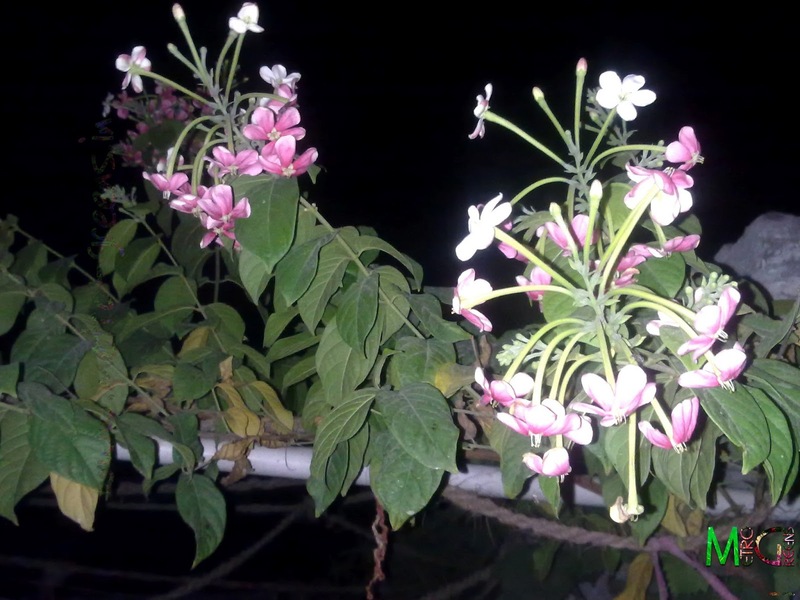 The placement of the plants on my roof is such that, when I reach the the roof from the staircase, I can easily smell the sweet fragrance of the rangoon creeper blooms in the air, and when I move away from it, I can still smell the fragrance of my arabian jasmine plants, which too are blooming now. 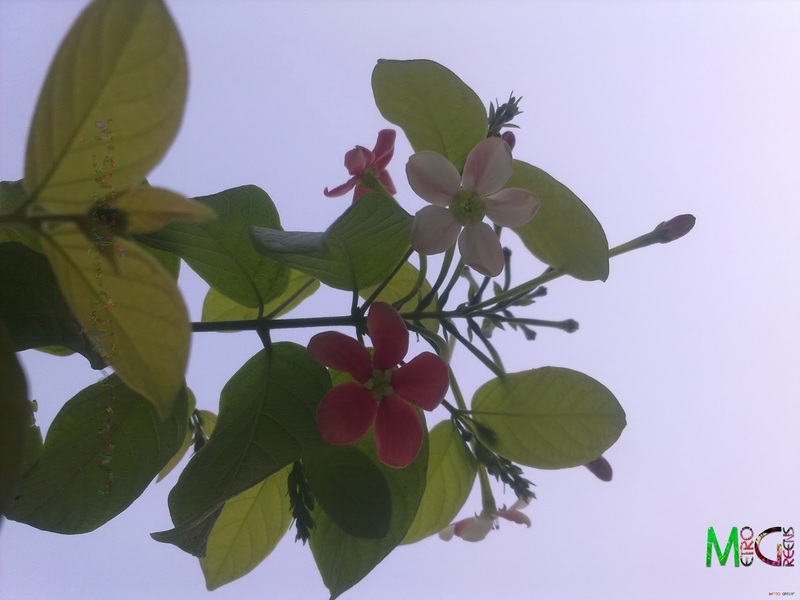 Here, I took some shots of the rangoon creeper blooming. Earlier whenever I saw the rangoon creepers, which are pretty common on the sides of the elevated roadways, which are commonly called as flyovers here in Delhi, I used to wonder, how a plant could bloom in two different colours, one white, and the other pink, but, on getting my own blooms, I came to know that the flowers bloom with white coloured petals, which gradually change to pink and then dark pink in colour, before drying and falling off the plant. 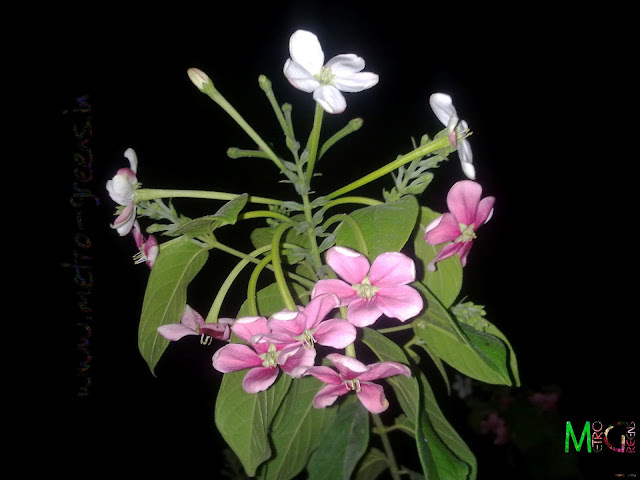 Here also, I suppose, you might be able to see both the white and the pink blooms. In the above picture, you could well see the ropes, which are woven out of coconut fibres, which, in my opinion, are well suited to the vines, so, I used the coconut fibre ropes to create a mesh like structure, so that my vines could climb up well. What lovely plants - I have never heard of them before but they do look very healthy. You must take good care of them. The wild asparagus is especially interesting and has a lovely form! Do you grow these climbers is pots or have you a space in the ground for them? Thanks Angie. I try my best to take good care of them, and seems like I'm being successful in my effort. And yes, I do grow these in pots only. 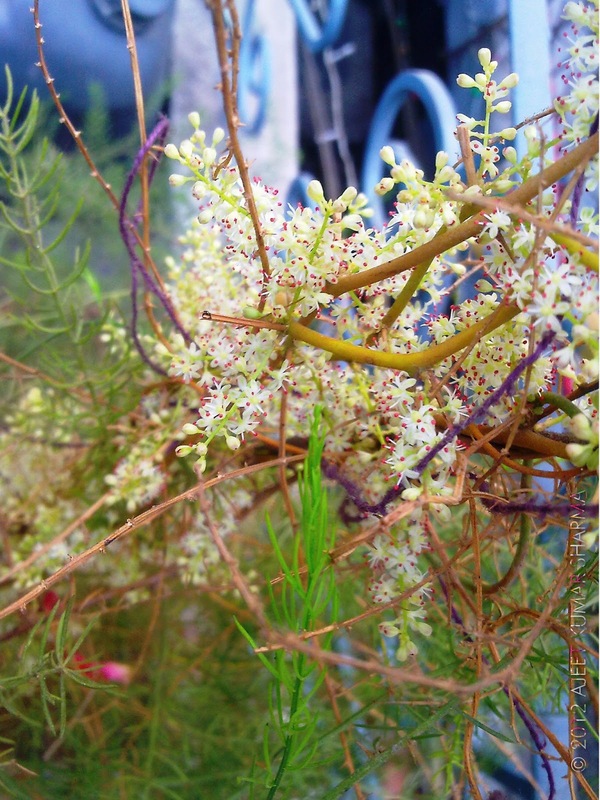 I love the flowers of the Wild Asparagus ! Lovely interesting blooms. Thanks Jane. And the fragrance is good too.